I love the fact they invented phone cameras. It makes me so happy that I can whip out my phone at any time and photograph something that captures my interest. And today, while I’m brain dead from being half way through the bumpout of Totem, I thought I’d share a couple. Most of them relate to crafty things I’ve found, and that makes me happy too. 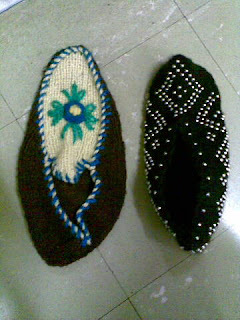 These are the traditional slippers that the Turkish women in my Knitting Workshop were telling me about. One of the ladies bought them in. They’re little knitted slippers that are beaded or embroidered and are worn in the house instead of shoes. The one on the left was hand crafted by the lady who bought them in, the one on the right was made by her mother in Turkey and sent over. I was working on Pacific, the Stephen Spielberg mini series, and they needed coloured light bulbs for a party scene. The question was how to dip 100 light bulbs and then leave them to dry without the glass paint running onto the metal socket. 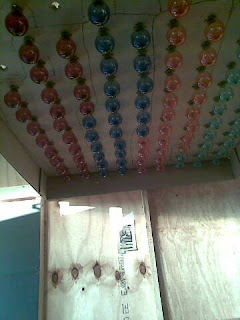 So we rigged up cardboard with heaps of holes and screwed the bulbs in. Then I dipped 25 into each colour. If you look carefully you can see the permanent texta lines which indicate the different colours. 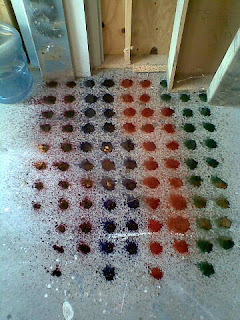 It was messy work, but the pattern it made on the floor was very pretty. Until we had to clean it off again. 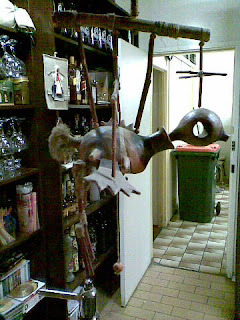 I was once at Como House, which is an old National Trust house in Toorak, and this was in the hallway. It’s a taxidermied bird, hung upside down. I asked the attendant why that particular direction was chosen. 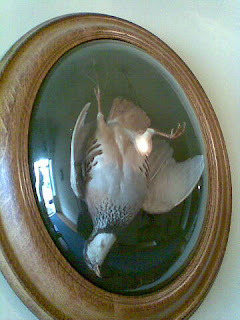 Apparently, once the birds are killed they’re hung from the hunters belt, and so there was a fashion in the 19th century (I think) to taxidermy them that way. To be true to the form, as it were. At the Lithuanian Club for Fringe, we dropped by the bar for a honey vodka (and you SO have to try one next time you’re there!) and hanging above the bar was this little marionette. This photo is centered, it’s very strange. And this is me with my Totem monster. It’s like a family photo! 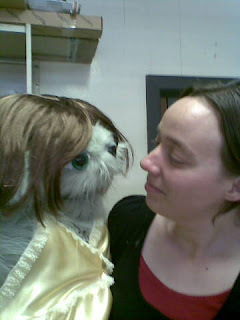 She looked great in the flesh too I might add, reminds me so much of a ‘wookie’ not sure what bad 80’s film that is from? Totem was great, I loved it – well done you. Parker loved it too, she wanted to know if my doll had made friends with the other dolls around her. I loved that, because I was so taken by the way that all the dolls were somehow connected, a real sense of each artist in all of them – amazing, and thank you! Wookies? AHAHAHAHA.. I never thought of that! It’s a Star Wars thing. That’s hilarious! Thank you so much! And I’m so glad you came down to see it. There was something incredible about it that photos just don’t capture. I loved how, even though no artist had seen any of the other dolls while making their own, that they all did come together so well. There were 2 strong themes running through the show – Wings and Hearts (plus a side theme of great bums!) which I found fascinating. And I loved how different all the dolls were, but at the same time how they all formed a cohesive whole. Awww you two are so cute together! Shucks, thank you. It’s like a family photo, isnt it. I’m dreadfully fond of her! She sits on top of the shelves in our loungeroom and looks over us all. I’m betting she’d make anyone peering in the windows blink.